This cute little sock monkey is from my original artwork/images, which was hand drawn with pencil and ink, then enhanced digitally. These valentines cards are so adorable! They're just perfect for your kids classmates at their school parties or just handing them out to friends & family. Not only is it easy & convenient to just print these out at home, but your kiddos will also have the cutest, most unique and coolest valentines amongst their classmates. 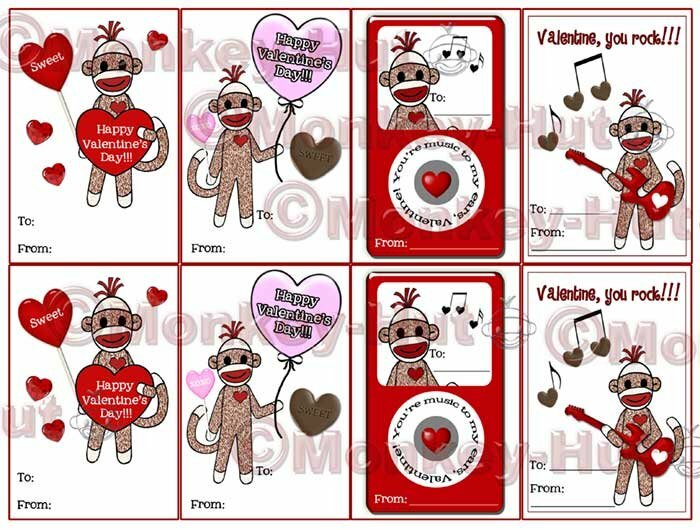 This listing is for one PDF file with 8 printable mini Valentine's Day cards on one sheet. Since this is in PDF format, it is not editable. Adobe Acrobat Reader is needed to use this file. It is a free download from Adobe at adobe.com. The PDF file will be emailed within 24 hours of receiving cleared payment (business hours). These are best printed on bright white card-stock. Simply print & cut. Print as many as you need.